Ultimate Tennis uses the USTA/NTRP system to determine play levels for Adult Leagues. To see more information about the NTRP rating system, please click here. In Tampa Bay and Atlanta the traditional USTA levels have been expanded to 13 levels. In these cities our "skill level finder" will convert your USTA level to the appropriate Ultimate Tennis skill. USTA skill levels above 3.5 will result in a higher Ultimate Tennis skill level. Your official USTA rating will not be affected in any way as a result of playing in Ultimate Tennis. You must be 18 years or older to compete in the adult league. New Players/Teams are defined as 1 or more players that have NOT played in Ultimate Tennis Singles or Doubles Leagues within the last 2 years. All new players and teams with regard to playoff eligibility are subject to our First Season Player Rule. New members must select a skill level at or above your USTA skill level in your first season. If you do not have a USTA/NTRP rating, click here to find your appropriate USTA/NTRP play level. You may also check with your tennis coach or favorite tennis pro to help determine your USTA/NTRP play level. Ultimate Tennis offers you the ability to play doubles and mixed doubles with partners of different abilities. 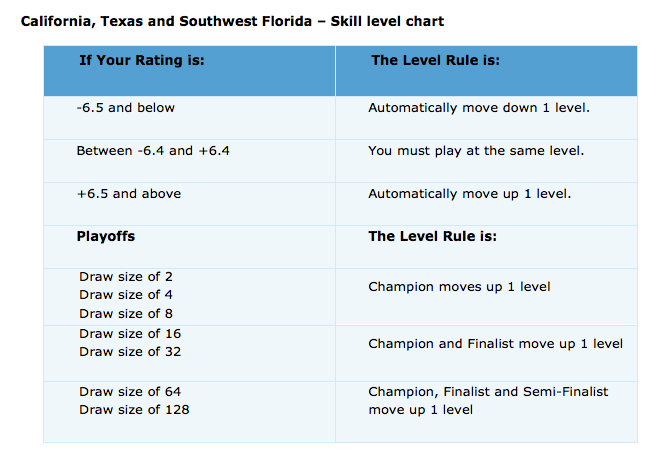 Both partner’s skill levels are averaged to produce a "team playing level” based on the chart below. If one of the players has played Ultimate Tennis before, your skill level choice will be determined during registration. If neither player has played Ultimate Tennis before, use the table below to determine your “team playing level”. During registration, our system will automatically calculate this level for your team. Mixed doubles leagues are designed to be more social and allow for a wider range of partner combinations shown in green. However, Ultimate Tennis discourages teams with partners more than two full playing levels apart (i.e. A team of a 3.0 player and a 4.5 player). 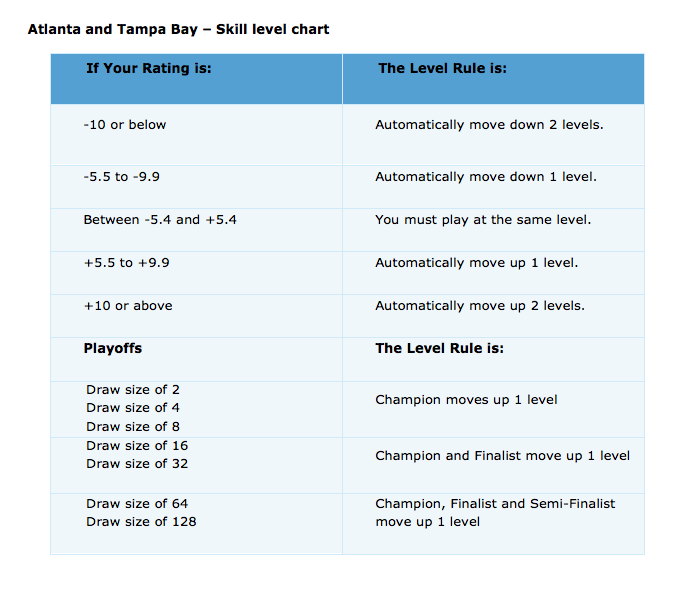 Your "team playing level" is the intersection of your level and your partner’s level shown on the chart below. First, find your level on the left hand side of the table below. Next, find your partner's level on the top of the table. The intersection of the two levels will be your Ultimate Tennis “team playing level”. New players/teams that do not follow our guidelines on initial skill level selection OR finish their season with too high a rating will be ineligible to compete in the playoffs. All new players and teams are subject to our First Season Player Rule. i) Any new singles player that has not played Ultimate Tennis within the last two years with an established skill level that finishes the regular season with a “move up” rating will automatically be disqualified and NOT eligible to compete in the playoffs. If a player continues to earn a "move up rating" in their second season and beyond they will be ineligible for the playoffs until they finish a season in which they don’t earn a move up rating. ii) Any new doubles team (either one or both players) that has not played Ultimate Tennis within the last two years with an established skill level that finish the regular season with a rating of +9.0 or higher will automatically be disqualified and NOT eligible to compete in the playoffs. iii) For detailed information on why the first season rule was established read the First Season Player Rule followed by the First Season Player Theory. Returning Singles Players are defined as players that have played Ultimate Tennis within the last two years. Returning Doubles Teams are where both players have played in a prior Ultimate Tennis Doubles League within the last two years. If one or both players have played Ultimate Tennis before (Singles or Doubles), your level choice(s) will be determined during registration. The system will limit what level you can register for based on your rating from your most recent season. Click here to view how we calculate your rating. If a player/team moved up to a new skill level in the last season of play and finished with a -5.5 rating or lower, the player/team will remain at your current skill level. This rule is designed to allow your game to adjust to the higher level of play. If the player/team finished the season with a -5.5 rating or lower, but in the season prior earned a rating of -4.0 or higher, the player/team will remain at your current level for one more season. If you moved up to a new skill level in your last season of play and finished with a -6.5 rating or lower, you will remain at your current skill level. This rule is designed to allow your game to adjust to the higher level of play. For approval to move down, you must contact customer service. If you finished the season with a -6.5 rating or lower but in the season prior earned a rating of -4.0 or higher, you will have the option to remain at your current level for one more season before moving down. To exercise the move down option, you must contact Customer Service. A. Don’t wait until the last minute to schedule your matches! Contact your first opponent as soon as you receive your schedule. Be considerate and prompt to help make Ultimate Tennis the best and most enjoyable league. Matches can be played out of order as long as they’re played by the corresponding "Deadline" date of each match. Print a copy of your schedule and keep it in your tennis bag. This will show your league participation should a facility require proof before you play as a guest. Ultimate Tennis allows you two weeks to play each match. The first week is the "scheduled week". The second week is the "make up" week. All matches have a "Deadline" date. The Deadline date (listed on your schedule) is the last day a score may be posted for that match. The ONLY exception is the use of a Late Pass (see Late Pass Rules Below). If a match is not played in the first week, the match must have a scheduled date by the first Sunday of the Make Up week. Directions and scheduled match time should be confirmed with the opponent. Your schedule is dynamic and will be updated as information changes. Be sure to check your schedule periodically for updates to your division. i.e. phone numbers, email addresses, new players, withdrawals, rain extensions etc. Print out new copies as needed. Matches must begin between the start times shown below unless both players/teams mutually agree to play at a different time. 1) Don't wait for your opponents to call you! Both players/teams are responsible for making contact with their opponents by the Wednesday prior to the Scheduled Week. 2) Each players/teams offers 3 available dates to play the match (not including the Sunday "deadline" date) or agrees to a date offered by the opponents. Dates and times offered to your opponents must coincide with the dates/times of the league the teams are registered in. (Example: Weekday Women’s league plays on weekday mornings, finishing up early afternoon.) Any other offered dates/times are not valid. 3) Once the match is scheduled, the rule to offer 3 available dates becomes obsolete and the "Rescheduling" rule would apply if the scheduled match is cancelled. IMPORTANT: If each team has offered 3 dates (within the timeframe for the match) and cannot agree on a date to play, the match is automatically scheduled to be played using the “Deadline/Final Times” below. Use common courtesy when arranging your matches. Rude phone behavior leads to on court confrontations. F. The Deadline/Final match times. If you are unable to contact your opponent, check your "online schedule" to see if there have been any updates to your division. New phone numbers, email address, withdrawn and replacement player information are posted daily. Please do not contact the office and ask what to do. Choose option 1 or 2 and move on to scheduling your next match. You may reschedule your match one time provided you give your opponents at least 24 hours’ notice (you must receive confirmation back from your opponent that they received your rescheduling request). A rescheduled match is automatically scheduled for the Deadline/final time on the “deadline” date UNLESS the players/teams agree to a different date/time or to use a "late score" pass. If you give your opponents less than 24 hours’ notice OR need to reschedule more than once, your opponent has the option of rescheduling or recording a "win by default". If both players/teams can’t agree on a later date to play the match, the opponent will take the win by default. For matches scheduled on the last "deadline" date of the season and are rained out, players/teams will receive a no points for the match. No late passes are allowed due to the start of the playoffs. Teams that have a match scheduled on the LAST "deadline" date of the season will run the risk of not playing the match if there is inclement weather. The late score pass is used to post a late score after the "deadline" date. The Late Pass is designed to help avoid defaults by providing members the ability to play one match beyond the posted deadline and by the last “Deadline” date. IMPORTANT - The late score pass is not valid for any match past the end of the regular season or for playoffs. i. Each players/teams has one late score pass per season. ii. Both players/teams must agree to play the match after the "deadline" date and normal match scheduling rules apply. iii. Decide which players/teams will use the late score pass. This must be confirmed by email by both teams (Do not email Ultimate Tennis). iv. How to use your late score pass: If the "deadline" date of the match has passed, the system will show a "Use Late Score Pass" link on the scoring page for that match. The team that agrees to use their late score pass must be the one to report the score (not the winner). Note: Once you click on this link, your late score pass is used. v.	All "late score" matches must be recorded by midnight of the last "Deadline" date of the season. The "late score pass" is not valid for any matches after the end of the regular season. There are no exceptions to this rule. Ultimate Tennis will not mediate any late score pass disputes. *If BOTH players/teams have a need to use the late score pass, we suggest you agree that the winning team uses their late score pass. *If a players/teams has used the Late Pass already but the opposing team has not, you can effectively play a second match late as long as the opposing players agree to use their Late Pass to report the score. * Ultimate Tennis will not grant additional late score passes. A. USTA “the code” rules of conduct apply. The current USTA Rules will govern play for procedures not covered by Ultimate Tennis Rules. Ultimate rules shall always supercede USTA rules of play. All players are expected to uphold their commitment to the league and the other players in the division by completing all matches. The Ultimate Tennis League permits the use of har-tru (clay) or hard (asphalt) court surfaces. The choice of court surface for the match is up to the home player/team. It is their obligation to let the opponent know what court surface the match will be played on and to relate any attire or footwear restrictions. The home player/team supplies an unopened can of yellow USTA approved balls for the match and will retain the balls after the match. Winners do not receive an unopened can of balls. Players/Teams may have up to a maximum of 10 minutes prior to the start of a match as a warm up. Remember, the warm up is not a time to practice "winners", return of serves, etc. Players should make a good faith effort to hit balls back as close as possible to their opponent. The winning player/team MUST post the match score before midnight of the “deadline” date listed on your schedule. However, all players have the ability to report scores and are ultimately responsible for ensuring that all scores are reported on time and accurately. If your match is scheduled on the “final deadline” date, you must play at the default times above unless all players agree on a different time on that day. If you get rained out on the “deadline” date, both teams will take a loss and receive zero points. However, players/teams can agree to play past the “deadline” date if one player/team has a late pass is available. Atlanta, California,Texas and Orlando : Any required court fee and/or guest fee must be paid by the home team. Private Facilities: - The visiting member is responsible for covering the guest fee up to a maximum of $10.00. Any amount exceeding $10.00 shall be covered by the home court player. When scheduling your match, please inform your opponent of any court or guest fees that are associated with your facility. Public Facilities: - Both players are responsible for covering their portion of any court fee associated with playing at a public facility. If your home court is not available for your match, you may play at an alternate site if it is not farther for your opponent. If it is farther for your opponent, you should offer to play at the opponent’s court. Public restroom facilities must be accessible year round and available during the entire match. Court surface must be in good condition. Courts must have adequate lighting for evening play. Nets must contain net straps and be set to the proper regulation height. Remain outside of the court area while the match is in progress. Not intervene on behalf of a player or team i.e. making line calls etc. Spectators that are disruptive in any way may be asked to leave by the opposing team. Failure to leave the court area is grounds for a default. In an effort to ensure matches progress within a reasonable time frame, the following standard USTA and Ultimate Tennis rules will be in force: Players are allowed a maximum of 25 seconds between points. Players are allowed a maximum of one minute and thirty seconds when changing sides of the court. Players are allowed a 10 minute break between the second and third sets. Players are allowed a one time 3 minute injury suspension Play shall never be suspended, delayed or interfered with for the purpose of enabling a player to recover his strength, breath, or physical condition. Players may have one toilet emergency visit per match which shall not exceed 5 minutes. No cell phones or beepers allowed on court. During the match, cell phones must be turned off or muted for match play. If a player needs to place a call during a match, they may make a call in the 90 seconds allotted for changing ends or the 10 minutes between the 2nd and 3rd sets. If you need to leave a cell phone on during match play for medical or emergency purposes and your phone rings, your opponents will be awarded the point in progress. Keep cell phones near and turned on. Have the opposing player/team's contact numbers on hand. Call the opposing player/team immediately if running late and provide a time frame your team will arrive (as long as it is not excessive beyond the 20 minute rule). A player/team having excessive forfeits may be disqualified from playoffs and/or suspended for the next season. This penalty also applies to any player/team withdrawing after the registration deadline and to teams that forfeit playoff matches. Conflicts should be settled by the players using the USTA rules and ‘The Code’. All players have the right to question a line call or score. If you dispute a call, reaffirm with your opponent what they saw and accept their decision. Remember... Good sportsmanship begins with fair play and a good attitude. Disagreements between players that are subjective in nature will not be ruled on by the League Office. While the league office will not rule on these events, we do want to be informed of all negative behavior. Players who encounter flagrant unsportsmanlike conduct are asked to report the incident to the league office so that a complaint may be logged and appropriate action taken. Because a league representative is not present during matches, we cannot take one player's word over the other. Players who encounter conflicts on court are expected to resolve them in an adult like manner on the court. The League Office will not mediate matches or settle disputes between players regarding these types of conflicts. Unsportsmanlike conduct: Ultimate Tennis reserves the right to refuse league play to a player that has a history of unsportsmanlike conduct complaints filed against him/her. Playoffs are held immediately after the completion of the regular season. Opting-In: All players/teams must "confirm their availability" to be included in the end of season playoff. Click on the link at the bottom of your schedule to confirm your availability for the playoffs. To be included in the playoffs you must confirm your availability before the end of the season. Please be aware that travel distances to playoff matches can be considerably further than regular season matches. Click here to read Playoff Qualifications. Click here to read the Playoff Seeding method. At the conclusion of the season all qualifying players/teams will receive an email notifying them their playoff schedule is available. Accessing your playoff schedule: Players that the playoffs, will see a new Playoff match at the bottom of your schedule. The highest seeded player/team will be the "home" player/team and provides the balls. Make sure you play and enter your score by midnight of the “deadline” date. Scheduling a playoff round: Each player/team must offer 2 dates to play in each playoff round, or agree to a date offered by the opponents - the same rules apply as in the regular season, HOWEVER during the playoffs the "deadline date" date can be used as one of your two offered days to play the playoff round. Due to limited days to play each round, weekend dates are valid to offer in all leagues. If a player/team cannot offer 2 dates to play the playoff round and cannot agree to any of the 2 dates offered by the opponents, the team forfeits the match. A team that has not offered 2 dates to play cannot force the playoff match to be played at the default time. If neither team has offered 2 dates to play the match and cannot agree to a date to play, the match is scheduled at the “default time” which is the last day of each playoff round. Default times for the “deadline” date are the last day of each playoff round at the times shown below. After entering a winning match, your next playoff match will appear on your schedule AS SOON AS YOUR OPPONENT IS DETERMINED. If it is not shown initially, please check back frequently to see if your next match has been determined. Deadline dates and default times for each round are listed at the bottom of your schedule page and the playoff draw. The full playoff draw for your league and level can be accessed by clicking on the playoff tab (next to the league standing tab), after the playoffs begin. The following may result in league league suspension: - Player/Teams that enter the playoff knowing they will be unable to complete the entire tournament. - Player/Teams that reach the city finals and forfeit the match. In the event of rain, the home player/team must verbally contact the opponent as soon as it is apparent that the match will not be played at the scheduled time. The home player/team should never assume the opponent knows it is wet at your courts and the visiting team should never assume that a match is canceled due to weather at opponent’s courts. DO NOT cancel matches via email. Always call your opponent when the weather is questionable. If Team A shows up at the courts to play at the scheduled match time/day, and Team B does not show because they assume the match is unplayable due to weather (without making contact with Team A), Team A may take the win by default. If weather dictates that you reschedule your match, you should do so before the "Deadline" date in case of rain on that day. If the player/team cannot agree to reschedule before the "Deadline" date, then the match is rescheduled at the default time. If players have assembled to play and the match is delayed or interrupted by rain or wet courts, players should be prepared to wait a ½ hour to determine if the court is playable. If after 30 minutes, or if forecasts indicate that a long delay is inevitable, players are free to leave and reschedule. If the match had begun, players should resume the match at the exact game and point as they stood when halted. New balls must be provided by the home team when resuming a match in the 3rd set, or with more than 2 days between the start of the original match. If the temperature is above 98 degrees or below 32 degrees (Fahrenheit) before the match is started, it is the option of the players to reschedule the match. Do not force an opponent to play in temperatures that can pose a health risk. If you have a match scheduled on the last "Deadline" date of the season and it is rained out it will go unscored. You cannot use a late pass. If a match is rained out and it will not be completed at later time, player/teams should report an incomplete match. Select this option from the scoring page. Neither player/team will receive the win, however, both players/teams will receive up to a maximum of 10 points based on the number of games won in their two best sets. A. All matches are the best 2 out of 3 sets. IF ALL PLAYERS AGREE, you may play a 12 point tiebreaker in lieu of a 3rd set. In this case, record the 3rd set score as 7-6. Scores for all matches (including "Forfeits" and "Retired" matches) must be reported by the winning player/team by midnight of the “deadline” date. Record the actual set scores. Tiebreakers are recorded as 7-6. If the score is not reported, the match score will be blank and each team will receive zero points. A score may be recorded after the “deadline” date by using a "Late Pass" (see "Late Score Pass" under "Matches"). One point for each game won in their “two highest scoring sets”. A losing player/team can receive up to a maximum of 8 points per match. A "Win by default" is reported when the opponent(s) is not available to play the match or does not respond to the opponent’s emails and phone calls by the Wednesday of the primary week. A retired match is the result of one player/team. A "Retired" win is reported by the winning player/team when a match cannot continue due to injury, illness, personal reasons or disagreement. To record a Retired match, enter the score of games/sets played and check the "Retired" box. An incomplete match is the result of weather or some uncontrollable event and not the result of a player/team. The games completed should be reported if the match will not be finished. When reporting a score for an incomplete match, enter the scores exactly what they were at the time play stopped. The system will detect that the scores are incomplete and will ask you what caused the stoppage in play. Players will receive up to a maximum of 10 points for an incomplete match. If a match score is not reported, the match will be shown as a blank or not played and each team will receive 0 points. A score may be recorded after the “deadline” date by using a "Late Pass" (see "Late Score Pass" under "Matches"). To help avoid the incorrect reporting of scores, players should confirm the final score with each other once the match is completed. The winning player should then report the match scores as soon as possible. If a player discovers an incorrect score, they should confirm the correct match score with their opponent and may re-report it prior to the deadline. Corrections of scores that are beyond a scoring deadline should be emailed to Customer Service. It is in the best interest of all players regardless of who wins or loses a match to review their scores on a regular basis so that corrections can be made in a timely manner. The League Office will not make corrections to scores once the final deadline for the season passes. All players are on the honor system and should never report a default unless it is warranted. Since the "winner" is the player determined to report scores, defaults should not be reported until the actual "winner" is determined. Serving - The player whose turn it is to serve will be the Server for the first point and will serve the first point from the deuce or right side of the court. The opponent will then serve the second and third points. The second point will be served from the ad or left side of the court and the third point is served from the deuce or right side of the court. Players will continue by serving alternately for two consecutive points. Each time the server switches the new server begins serving on the ad or left side of the court. TIP: When the score total is EVEN, you always serve from the deuce side. When the score total is ODD you always serve from the Ad side. Changing Ends - Players change ends after every 6 points and at the conclusion of the tie-break game. For example, when the score reaches 4 - 2, the players will switch sides. Note: The player serving immediately prior to a changeover will take their second serve once the changeover is made. Scoring - Players receive one point for each point won. The tie-break winner is the first player to reach seven points provided there is margin of two points. If there is not a margin of two points, play continues until a two point margin is reached. If service from a wrong half of the court occurs and is undetected, all resulting play shall stand, but the error should be corrected as soon as it is discovered. If you are injured please try to determine if your injury will cause you to be unable to complete the season or is temporary. If your injury is permanent and you are unable to complete the season, please email the league office immediately. We will attempt to replace an injured player. If your injury is temporary and you will only be out a short time, you may use your late pass or use a substitute player (please refer to the substitute rules listed below in section 9). If a player has withdrawn from your division, your schedule will show "Withdrawn" in place of the player's name. If you were scheduled to play a withdrawn player, you may either report a default and receive 12 points or play a substitute player. A substitute player can be anyone in your division or anyone on the substitute list. You must report a default or sub score anytime before the end of season deadline date or you will not receive points. If your partner becomes injured, we will allow a one time, for the season, replacement. This will allow your team to complete the season provided that the player is added during the first three weeks of play. The replacement player must create or have a profile in the Ultimate Tennis system and must be rated at or below the team's current ULTIMATE TENNIS level of play. If a team has withdrawn from your division, your schedule will show "Withdrawn" in place of the players names. If you were scheduled to play a withdrawn team, you may report a default and receive 12 points anytime before the end of season deadline date or you will not receive points. There are no refunds or credits for withdrawals after schedules are posted. Substitute players should be utilized in the event of scheduling conflicts, temporary injuries, illnesses, when "sub" is listed on the schedule, or when a player has withdrawn from a division. 1. A "sub" may be any Ultimate Tennis player at your skill level that is enrolled in the current season of play. This includes players within your own division as well as those not listed on the sub list. 2. You may be scheduled to play a sub. Division sizes may vary from 4 to 12 players. Although we strive to maintain an even number of players in each division, sometimes the number of registered players for a specific section of town ends in an odd number. Because it is required to ensure that every player in the division plays an equal number of matches, in an odd numbered division, one player is randomly selected to play a sub match for their last match. If you were selected to play a "sub" match this minor scheduling anomaly can actually provide you with a nice late season benefit. You have the option of playing a match or receiving a free 12 point win which may be desired if your personal schedule is tight. If you are assigned to play a "sub" on your schedule - click the blue "Find a Sub" button at the bottom on your schedule to get a list of subs in your area. If you are unable to find someone to play, you are allowed to report a default and receive 12 points instead of playing the sub match. 3. If your personal schedule prevents you from being able to play your match within the two week match window, it is your responsibility to call a sub to play in your place. If you arrange for a sub to play in your place you will receive points based on the sub player's results, "win or lose" just as if you played the match. If you do not arrange for a sub to play for you and your opponent has to find the sub themselves, you will receive zero points for the match. 4. There are times when players are unable to coordinate their schedules in order to play their match. When both players wish to play the match but can't schedule with one another, they each may elect to play a sub independently of each other. In doubles and mixed leagues all teams are required to play their scheduled opponents. A sub match may only be used when a team's schedule indicates "Sub" as the opponent in the last week of play. A sub match is a mathematical scheduling requirement when there is an odd number of teams in a division. It is required to ensure that every team in the division plays an equal number of matches, "five" per season. One team is randomly selected to play a sub match for their last match. Although we strive to maintain an even number of teams in each division when possible, sometimes the number of registered teams for a specific section of town ends in an odd number. If your team was selected to play a "sub" match this minor scheduling anomaly can actually provide you with a nice late season benefit. Play any team in your division as a "Sub Team" any time before the end of the season. Use the "Sub Option" when reporting your score. Note: Playing a sub match will count towards your team's standings and points but not for the Sub Team. This is simply an extra practice match for them to play. If you have a strong team you may want to select this option if you think you can win in two set which will earn your team 14 points instead of the 12 points for the default win. When you report a match score, a confirmation email will be sent to your sub to verify that the match was played and scored correctly. This sanity check prevents unscrupulous players from fabricating sub matches. If you have a substitute play a match for you and the sub wins the match, it is your responsibility to report the score and choose the option that says, "A sub played for me". If you are playing a sub independently of your opponent, choose the "I found the sub and arranged the match" option. Note: All matches against subs count towards your point standings and playoff seeding, but do not count towards your rating. The league office will make every attempt to replace withdrawn players with a "replacement player" from the waiting list when there is an available player in the same section of town. You are entering the league after play has begun therefore, as a new member you should take the initiative to alert your opponents that you have been added to the division. Play begins from the point you are added to a division going forward. You may play any match that does not have a score reported. Replacement players may not make up past matches. Exception: If the opponent scheduled to play the withdrawn player has not reported a score for that play week, they may elect to play you as the replacement player and utilize a late pass to enter the scores. You have a late pass available that may be used to report a late score for future matches however you may not use a late pass to report a score for a past due match. You may play a sub or report a default only for future scheduled matches against a regular opponent. You may not report a sub score or a default for any past matches. To be eligible for the playoffs, all members, including replacement players must complete a minimum of 4 matches against the assigned opponents on their schedule. When a player withdraws from your division, we will work very hard to fill the opening left by the withdrawn player. Should we find a replacement player to take the spot, the following options are available. If you have not already reported a score against the withdrawn player, and the scoring deadline has not passed, you will play the replacement player as you normally would. If you played a sub or reported a default for the withdrawn player in advance of the scoring deadline, you may elect to re-play the match with the replacement player and re-report the scores by the posted deadline. If you have not reported a score for a past match scheduled with a withdrawn player, you may elect to play a match with the replacement player and utilize your late pass to report the scores. In the event you or your doubles partner suffers a permanent injury or illness and cannot complete the season, we will allow a one time, permanent replacement for the season to allow your team to complete the season. Replacement Players may be added only during the first three weeks of play. Provide the name of the player who is replacing the withdrawn player. For the Replacement Player to qualify, they must have a current profile and be rated such that the team's current level of play will remain the same. Report a default and receive 12 points. Play the team later in the season if they are able to find a permanent replacement for the withdrawn player. Email customer service any scores from make up matches against teams with withdrawn members. A. Division Winners are determined by the player/team with the most points. If there is a tie, the player/team with the best rating will be declared the division winner (we recognize all tied for first place based on Points as Division Winners). B. All Division Winners will receive bag tags and car magnets. You can login anytime after the “deadline” date of the last match of the season to view the final standings. Protestable Conflicts occur when an actual rule violation happens while on court. In this case the violation may justify filing an Official Protest with the league office. The league office will only mediate disagreements between players where an Official Protest is justified and was issued to the offending player at the time of the infraction. Non protestable conflicts are disagreements between players that are subjective in nature and will not be ruled on by the League Office. While the league office will not rule on these events, we do want to be informed of all negative behavior. Players who encounter flagrant unsportsmanlike conduct are asked to report the incident to the league office so that a complaint may be logged and appropriate action taken per our Three Strike Policy. Because a league representative is not present during matches, we cannot take one player's word over the other. Players who encounter conflicts on court are expected to resolve them in an adult like manner on the court. The League Office will not mediate matches or settle disputes between players regarding these types of conflicts. Resolving on Court Conflicts provides helpful information on how players can work together to solve conflicts if and when they occur. The best way to avoid scoring conflicts is to call out scores clearly before the start of each point as well as each game. When a dispute in scoring occurs, players must go back to the last point or game in which they agree upon and resume the match from there. 3rd Complaint - Player is suspended from the league for one year. Players returning after a one year suspension are on a "One strike - zero tolerance policy". ANY new complaints will result in a "Permanent lifetime suspension" from the league.